Sonic Bed_Shanghai was commissioned by the British Council 2006 as part of Sound and the City, exhibited at the Xuhui Art Museum, Shanghai and was made by Kaffe Matthews in collaboration with local practitioners after two research trips to Shanghai, December to February 2006. 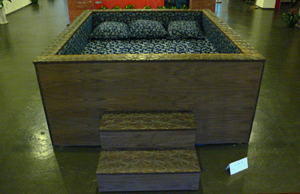 Sonic Bed_Shanghai was the first bed to be made in the Worldwide Bed series, designed and composed for by Kaffe Matthews, with ongoing software instrument collaboration with David Muth. 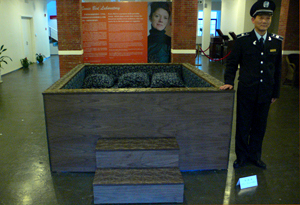 Each of these worldwide beds use the same basic design as the original London version, but are made locally with local materials, with a new sound work being made by Kaffe in the first instance using site specific sound material of that country. 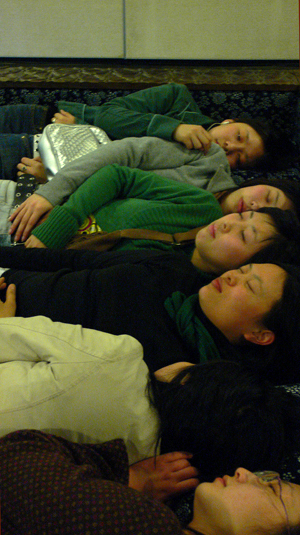 It plays the 12 channel vibratory work “Horn” made by Kaffe using sounds recorded in and around the Bund and the Huangpu river during her research trips 2006, drawn, processed, mixed and structured within the Bed whilst lying in it. 4 x wooden side panels. 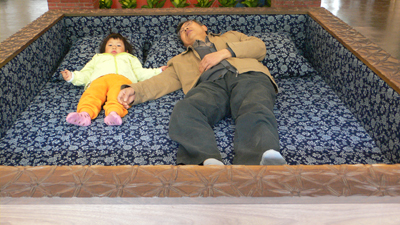 1 x flame retardant foam mattress.